Is the battery replaceable on the PLB1? Yes, the battery will be replaceable after the expiry period or after the unit has been activated. The battery is not user replaceable and must be sent to an authorised service dealer for replacement. Please contact the distributor in your country for further information. If I register my PLB in one country, can I use it in another country? Yes, you can use your PLB anywhere in the World. When you register your PLB, make sure you give emergency contacts who will know where you are if you need to activate the PLB in an emergency. This aids the rescue authorities to make sure it is a real alert and will speed up your rescue. What is the location accuracy of the rescueME PLB1? The Cospas Sarsat system uses two methods of locating a beacon. The satellite system is designed to locate your beacon using the transmission alone. The accuracy of this fix is approximately a 5 nautical mile radius, but is typically much better. 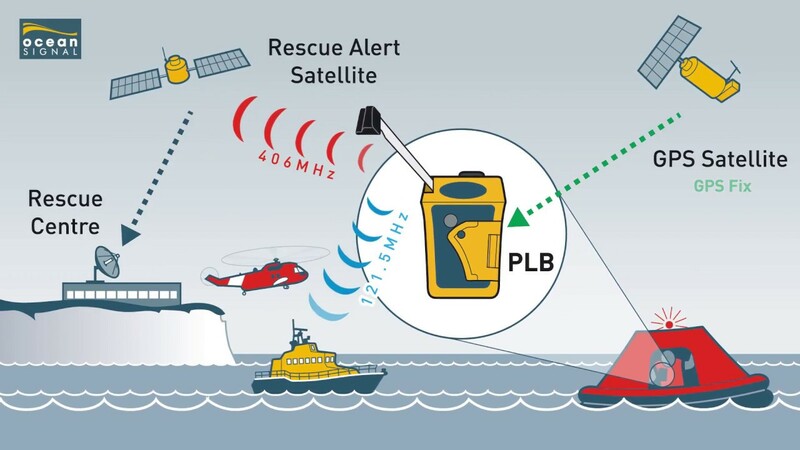 The rescueME PLB1 has a built in GPS receiver which is used to encode the position in the transmission. When the GPS has a reliable fix, usually within a few minutes, the accuracy is typically within 100 metres of your actual position can be acheived. Why is the pouch permanently attached to the PLB1? For Australia and New Zealand the regulations require that the PLB must float. Because of the small size of the rescueME PLB1, the pouch is used to provide buoyancy and must be permanently attached when supplied in those countries. If you require to remove the pouch for land based usage, cut the black cord leaving enough length to make a loop to re-attach the pouch or to tie a separate lanyard to. When testing the PLB, I get two green flashes. What does this mean? The test indication is repeated. So for a battery which has been used for less than one hour, you will see single green flash, which is repeated after a short pause. If the battery has been used for over one hour, the indicator will change to an amber (orange) colour. Over two hours and the indicator will flash amber two or more times in a close group, which will be repeated after a short pause. Under normal circumstances the battery in the PLB1 should be replaced before the expiry date marked on the unit. If the unit has been activated in emergency or if the test indicator LED is flashing amber (orange) the battery must be replaced before it is used again to ensure the full 24 hours of operation in emergency. The typical lifetime of the PLB1 is greater than 24 hours, but this is under defined conditions of storage and test usage. Do not assume that just because the activation was only for a short length of time the battery will not need exchanging. Details of battery exchange in your region can be found by enquiring with your local distributor. Please see www.oceansignal.com/stockists for information on our distributors. Carrying a PLB on aircraft as luggage. The Ocean Signal rescueME PLB1 can be safely carried on board a passenger aircraft as either checked in or carry on luggage under section 2.3.5.9 of the IATA Dangerous Goods Regulations. The lithium metal battery in the rescueME PLB1 contains less than 2g of lithium and have been tested in accordance with 38.3 of the UN Manual of Tests. Precautions should be taken to prevent accidental activation if placed in checked in baggage.